Nuts for St Patrick’s day! 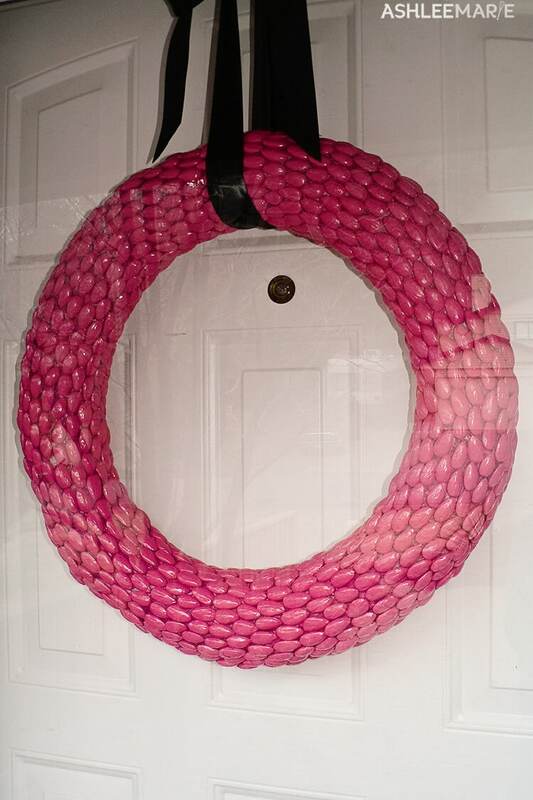 I, like many others, saw this wreath that Dana made and fell in love with it. 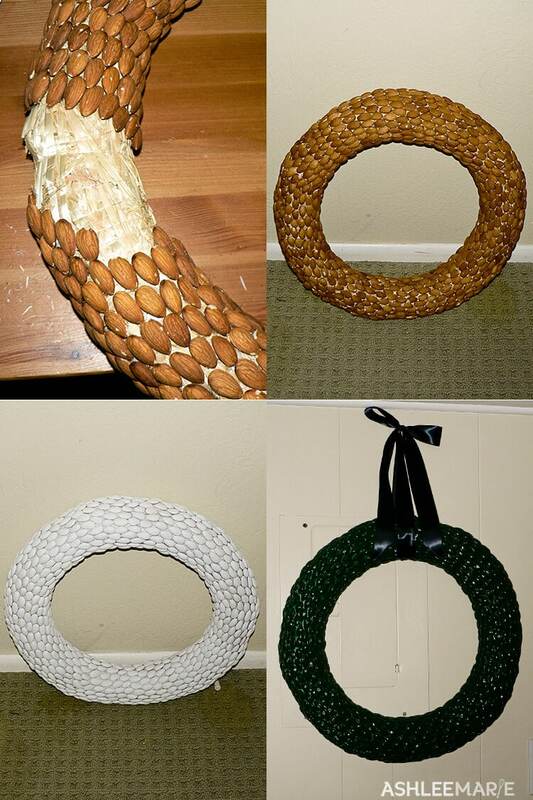 Since most of us don’t have access to so many and such pretty acorns all us fan’s have used other nut’s and items. Here and here are some examples. So I started looking around for what I might use. 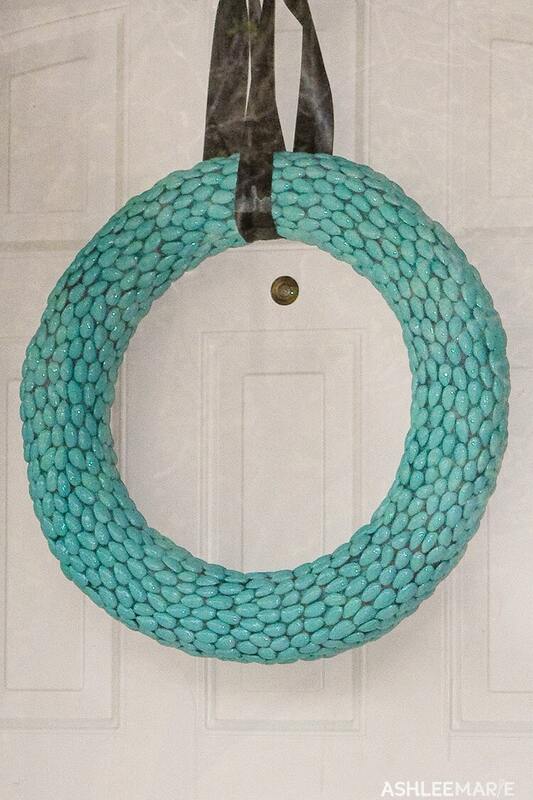 I thought the beads were a great idea because you don’t have to worry about them rotting. But I couldn’t find the same beads easily and I was at Costco and saw their huge bag of Almonds and thought it might work out well. The wreath I found at DI for $1 so I was ready to go. I went with 18 inch, even though it’s too big for the doors here I want to make sure it’s big enough for where ever we live next. I set about hot gluing the almonds to the wreath! I have a pretty cool hot glue gun so not burns, but at the same time they didn’t stick as well. I’m still nervous they’ll fall off too easily. When I put the wreath down to take a picture of it George, our micro mini pot bellied piglet, started eating on the bottom nuts! I had to put him in his room to get the shot. hoping it would help seal it a bit before starting. So here it is primed (I think I’ll do what Dana does and keep changing the color to match the season, so I’ll use the primer again). Finally I went with a dark green for St. Patrick’s day! I’m running out of space in our half of the basement and don’t have a good door to place it on where it won’t get hurt by the kids. Plus with our low ceilings it hangs WAY too low. So I put a nail up at the top of the wall (only a few inches higher than my head) and hung it there. With the panel behind it’s pretty ugly. I’m still hoping to find a better spot for it. If only I had a front door!!! Previous Post: « Etching bathroom Mirror!